NUJ representatives voted 51-1 to suspend the strike due for 15-16 November, for further talks with the BBC. 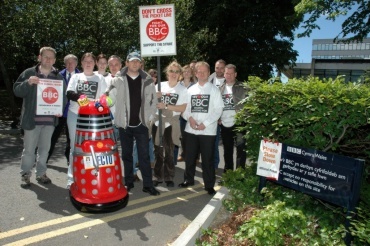 The BBC has withdrawn disciplinary action against members who struck overseas. Unions at the BBC will now meet management over the pension proposals, within a week of the end of the formal consultation period on 15 November. NUJ members who are employees of the BBC - and members of two other BBC unions, BECTU and Unite - voted for strike action to stop what the unions termed a "robbery" of their pensions. However, after an 11th-hour improved offer from the BBC on 1 October, the announced strikes are postponed and there is a consultative ballot, which closed on 28 October. NUJ members voted 70:30 to reject the offer and are striking on 5-6 November. A further strike is scheduled for 15-16 November. Freelances who find themselves unavailable for work at the BBC on any strike day, and who suffer hardship as a consequence, should contact the BBC NUJ chapel. LFB at its last meeting voted a donation to the hardship fund.